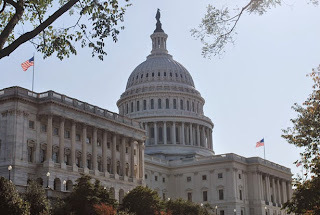 WASHINGTON (The Nil Admirari) - Earlier today, the U.S. Department of Reality released a report warning Congressional Republicans a government shutdown would disrupt significant government spending and harm an already weak economy. Republicans responded to the "Shutdown Bad for Economy" report by ignoring the estimated $24 billion price tag from the 2013 government shutdown, and vowing to defund the Department of Reality for "using facts to advance a partisan agenda." "If Republicans shut down the government over something absurd, like doctored Planned Parenthood videos, most of the money the federal government regularly puts into the economy, which is a ton, will dry up. That will result in a ripple effect hurting individual Americans and businesses alike in our struggling economy," stated Secretary of Reality Horace Green. The place Republicans are conspiring to cause another government shutdown (above). Senator Ted Cruz (R-TX) was the first to condemn the Department of Reality's report and stated, "The Republicans need to defund Planned Parenthood and the Department of Reality now. It is clear to me that Secretary Green has a partisan agenda, and is a mouthpiece of the Democrats and reality, both of which I strongly dislike." "What kind of game is the soon-to-be-defunded Department of Reality is playing?" asked Speaker John Boehner (R-OH), who stood next to an empty jug of Carlo Rossi Chablis. "Republicans are not going to shut down the government. President Obama and Democrats will shut it down when they refuse to give us what we want." Senate Majority Leader Mitch McConnell (R-KY) announced he sympathized with defunding the Department of Reality, but was "working really hard" on legislation to fund the federal government "all the way through December or so." Congressional Republicans announced they were refusing to read a second report released by the Department of Reality titled "The Economic Ills of Governing By Crisis."